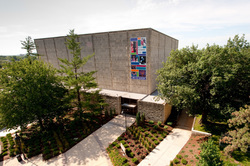 The Department of Music at KSU is housed in the handsome McCain Auditorium, opened in 1970 with extensive additions in 1974. This flexibly designed, acoustically adjustable facility incorporates several innovative concepts. 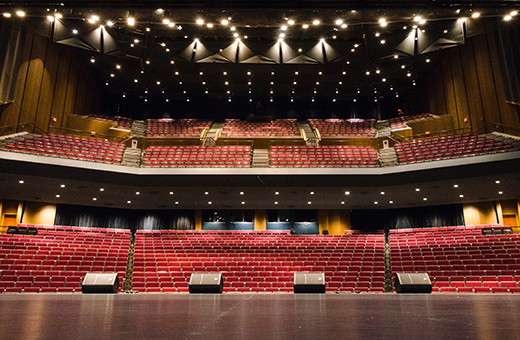 The seating capacity is approximately 1,800 but a touch of a button lowers the ceiling to cut off the balcony and reduces the capacity to 900 for smaller, more intimate productions. Acoustical panels may be adjusted to adapt the auditorium for solo presentations, drama or large orchestral concerts. A three story addition to the east provides instructional, rehearsal and storage rooms for the Department of Music including ample classrooms, rehearsal halls, practice studios, and offices. The McCain Performance Series brings to the campus large musical attractions, world famous soloists, and chamber music, as well as dance troupes and drama companies. Faculty recitals expand the opportunities to hear performances of professional caliber. Pictured is the newly renovated computer lab in Room 324, containing 15 Macintosh workstations complete with MIDI keyboards and headphones. This state-of-the-art room is completely updated and is one of the best music technology labs in the country. Pictured here is our small recital hall called Kirmser Hall. 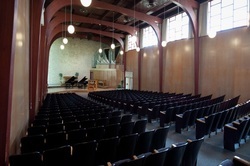 This hall contains a grand piano and seats up to 150. 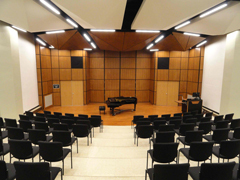 This newly renovated space is perfect for solo and chamber recitals as well as lecture presentations. It is fitted with new recording and video equipment as well. All Faiths Chapel, built in 1956, seats just under 500 and was dedicated as "a memorial to the Kansas State men who made the supreme sacrifice in World War II and Korea." Exceptional care was taken in the design of the chapel to achieve proper acoustical balance for solo instruments and string quartets while assuring sufficient resonance for organ music. 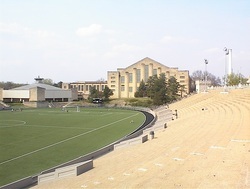 Memorial Stadium was built to remember the students and graduates of the college who had fallen in battle in World War I. The memorial Stadium field is the rehearsal space of the K-State "Pride of Wildcat" Marching Band. The surface of the field is made of the same material as in the Bill Snyder Family Stadium. The turf and lighting make for one of the greatest marching band practice facilities in the United States. Hale library was designed in a "collegiate Gothic" style to recall the architecture of building on the campuses of Oxford and Cambridge campuses and many other campuses of the 1920's. 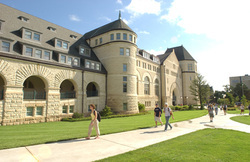 Kansas State University has been one of the designated depositories for government publications since 1907. The library was expanded, renovated and rededicated on October 5, 1997, at this time renamed Hale Library. The library houses an extensive collection of books, scores, and recordings.